CorkSport Mazda Performance, a leading manufacturer and reseller of Mazda aftermarket performance parts, is proud to announce another addition to its front mount intercooler line. This latest Front Mount Intercooler Kit for Short Ram Intake kit is designed specifically for the Mazdaspeed 6. CorkSport Mazda Performance, a leading manufacturer and reseller of Mazda aftermarket performance parts, is proud to announce another addition to its front mount intercooler line. This latest Front Mount Intercooler for Short Ram Intake Kit is designed specifically for the Mazdaspeed 6. 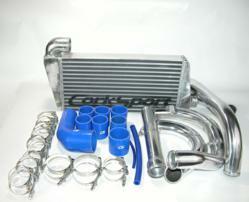 Designed to replace the restrictive top mount intercooler, the CorkSport front mounted kit has been developed for optimal placement in the path of the inflow ambient air, allowing for maximized heat dissipation and reduced heat soak, a common problem associated with the stock top mounted intercooler location. The kit features a 21x10x3” bar and plate intercooler core, mandrel bent and TIG welded polished aluminum intercooler piping and custom reinforced silicone connectors made from multi-layer nylon braid to provide strength and a smooth internal transition for less turbulent air flow. The kit includes stainless steel T-bolt clamps to ensure an airtight seal all of the needed installation hardware and detailed installation instructions. During extensive testing, the CorkSport Mazdaspeed 6 Front Mount Intercooler showed an average pressure drop of 1.5-2 psi and an astounding 10 to 1 temperature drop, meaning for every ten degrees of inlet temperature, the outlet temperature of the intercooler only goes up one degree. The kit has been designed to integrate seamlessly with our popular CorkSport Power Series Short Ram Intake and can be purchased as a standalone kit to compliment your current short ram intake or can be purchased with the CorkSport Power Series Short Ram Intake for additional savings and power gains. The CorkSport Mazdaspeed 6 Front Mount Intercooler for Short Ram Intake is priced competitively at $699.00 with optional CorkSport Short Ram Intake available to purchase with the kit for $200, a savings of $49 off the Short Ram Intake when sold separately.